Difficulty: Fairly strenuous. A steep descent followed by a long climb back up! There is no shade so this can be a hot walk – make sure you wear a hat and carry plenty of water. 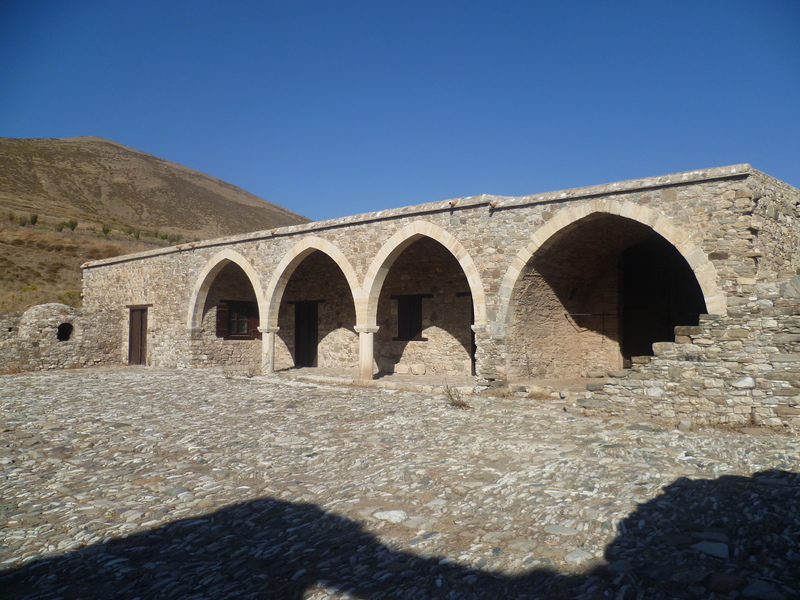 This is a beautiful walk on earth, gravel and concrete tracks which takes in one of Cyprus’ best-kept secrets:an ancient church-monastery hidden away in the Pahos hills. 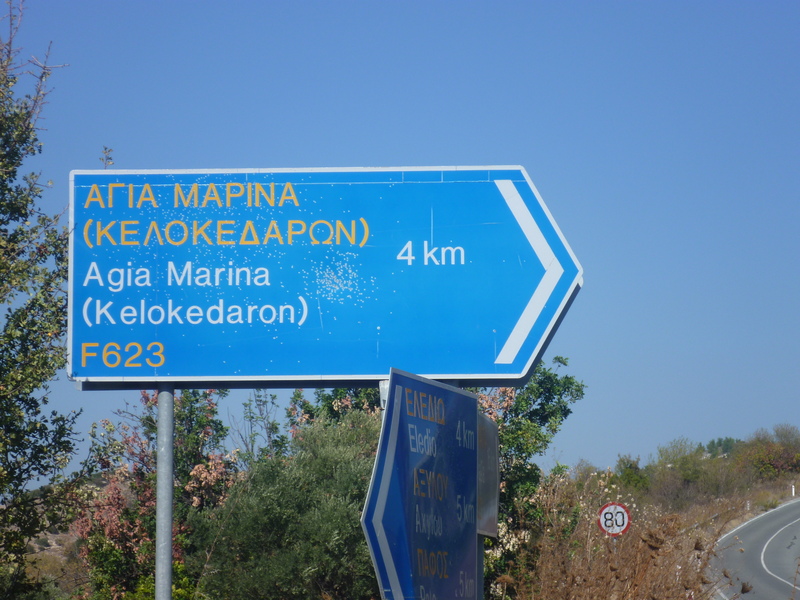 To arrive at the starting point, drive past Amargeti on the F622 and just after the village you will reach a right turn to Agia Marina (Kelokedaron) 4km on the F623. 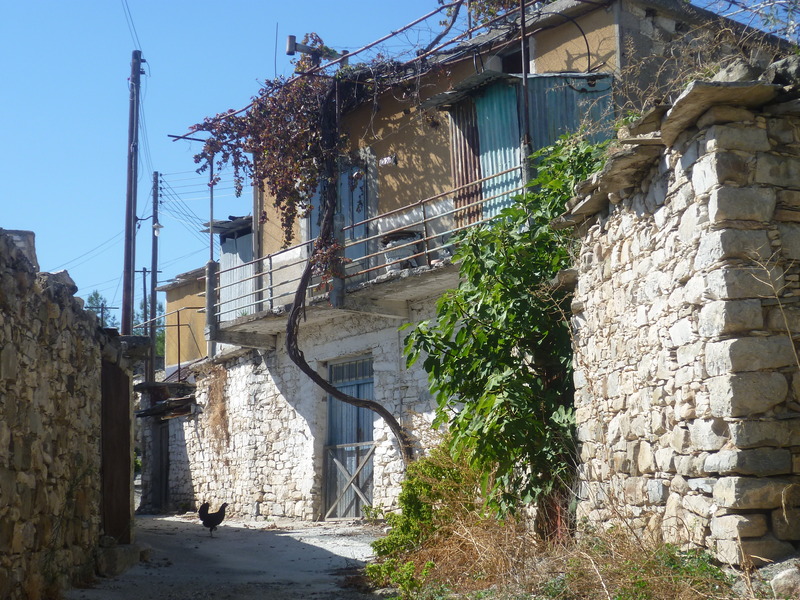 Follow this road and drive into this quiet village, which has a well-kept church, plenty of cats and even some donkeys, an increasingly rare sight in Cyprus. The walk starts from the church in Agia Marina. Just past the church you will see the village fountain. Turn left here, following the sign to ‘Pentalia 4km’ and after about 10-15 metres turn right downhill. 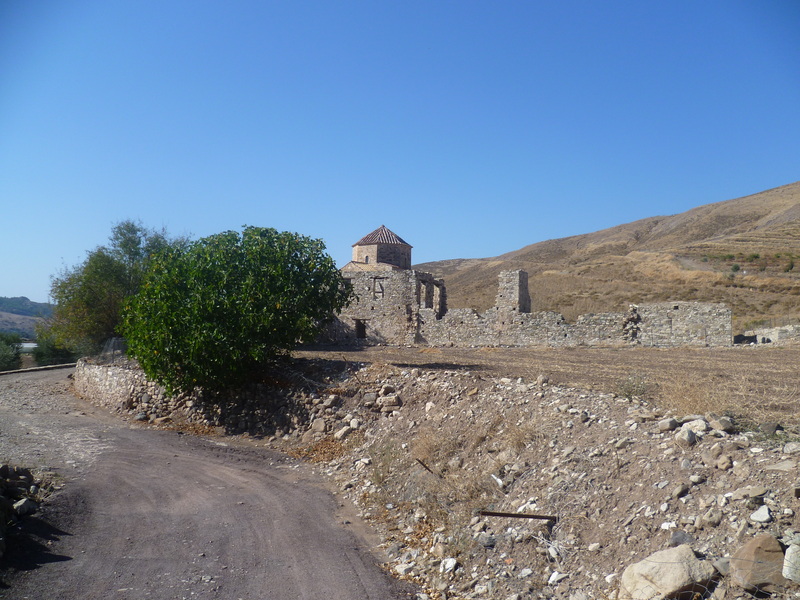 There is a new sign which points towards “Sindi Church”. Follow the steeply descending road, passing a newly-constructed water fountain on your left after about 3-4 minutes. 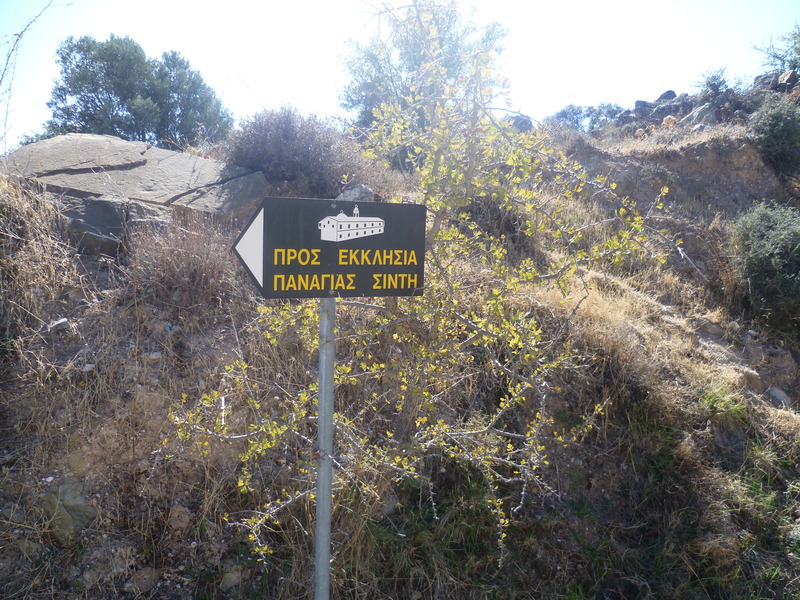 The road will take you to the Xeros Potamos river bed at the bottom of the valley below you. 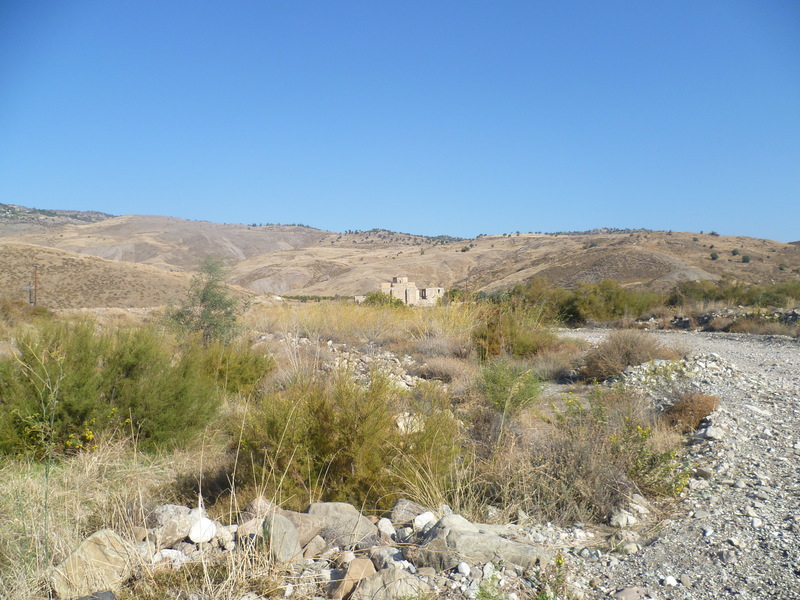 There are in fact any number of tracks from Agia Marina down to the valley floor and it doesn’t really matter which one you decide to take – just head for the river bed. As you do so you will get fabulous views across the valley and (if you’re interested) see plenty of birds. After 35-40 minutes you will reach the river bed near a ford crossing. You’ll be able to see – and definitely hear! – a donkey farm just on the other side of the river. Don’t cross the river. Turn left and make your way along one of the numerous tracks which follow the river (or more likely the dry river bed) upstream. 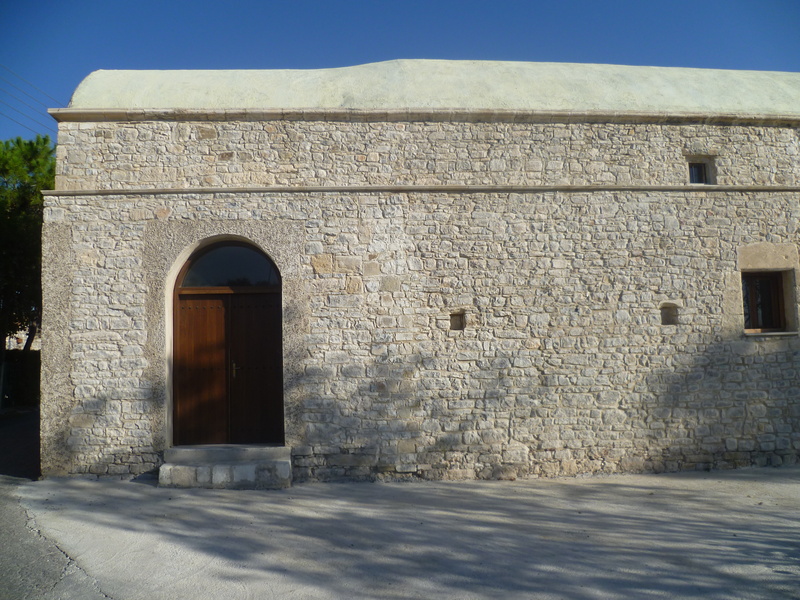 In a few minutes you will see the restored but deserted monastery church of Panagia tou Sinti ahead of you. 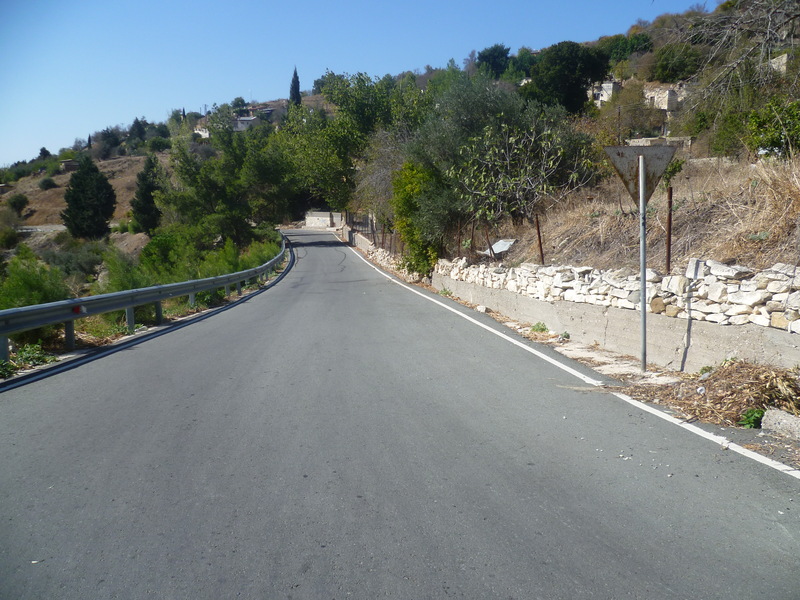 You should reach Panagia tou Sinti after a leisurely 1 hour 5 minutes. We think that Panagia tou Sinti is one of the loveliest places in Cyprus and you will almost certainly have it to yourself. It was sympathetically restored in the 1990s. The 15th century church (locked) is on the south side of a courtyard which has a well in the centre and is surrounded on the other three sides by partially restored outbuildings. You can sit in the shade of the cloisters to rest and listen to the hundreds of house sparrows nesting in the ruins. Water is available just outside the monastery gates and there is even a toilet block away behind the site! Apparently this valley is one of the best places to see Bonnelli’s eagle. We’ve never been lucky enough to see one here, although we were quite excited to see a Finsch’s Wheatear near the church at one of our visits! When you’re ready to leave, go back out through the main gates, turn left and follow the track as it goes to the left and starts to climb away from the valley bed. After about five minutes you will cross a little stream (the river Sinti) on a small concrete bridge. Look up the hill to your right and you will see some signposts – follow the path toward these and you should reach them at around 1 hour 15 minutes. 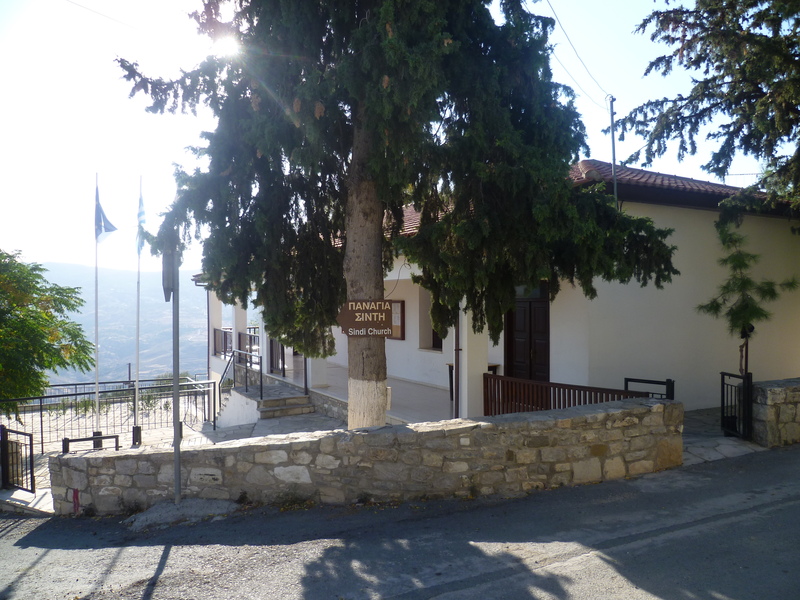 They point to ‘Panagia tou Sinti’, ‘Salamiou 7km’ and ‘Pentalia 5km’. Follow the signed track up the hill to Pentalia – this is quite a stiff climb. It’s not too steep but it’s long and quite an ascent from the valley floor up to Pentalia at 799 metres. Crucially, there’s no shade on this climb and it always seems to be hot, even when we’ve walked this route in November! …will tell you that you are almost in Pentalia. As with the route down to the valley bed there are a number of upward tracks and it doesn’t really matter which one you take. The village of Pentalia remains stubbornly above you and to your left for most of the climb! You should find your way without too much difficulty. It is a slog but there are terrific views across the Paphos valleys to be had on the ascent. As you enter Pentalia at around 2 hours 25 minutes you will see a concrete water trough (and water supply) to your left. The right fork leads into Pentalia and you can see the community centre and mayor’s office on your right. There is a nice little church just a few metres up the road here – a good spot for some shade and a well-earned breather in this traditional old-style village. Your route out of Pentalia, however, is straight on past the water trough at the junction on the road to your left that leads slightly downhill. This almost entirely traffic-free road becomes little more than an undulating country track along the valley ridge, offering panoramic views across the valley to the wind farm at Khapotami in the distance. Relieved of the need to do any more serious climbing, it will easily take you all the way back to the village of Agia Marina, arriving back at the church after a fairly relaxed 3 hours 25 minutes of walking.